What is it about summer that makes us all feel like kids? Maybe its the fact that you can walk around without shoes on and not be judged, or the fact that your hair can take on that “beachy” quality without people questioning if you have actually been at the beach. What I do know is that summer puts me in the mood to be youthful and to enjoy each minute in the sunshine. And as a result of my feeling youthful during this season, I seem to have developed a fondness for bunk beds or bunk rooms. 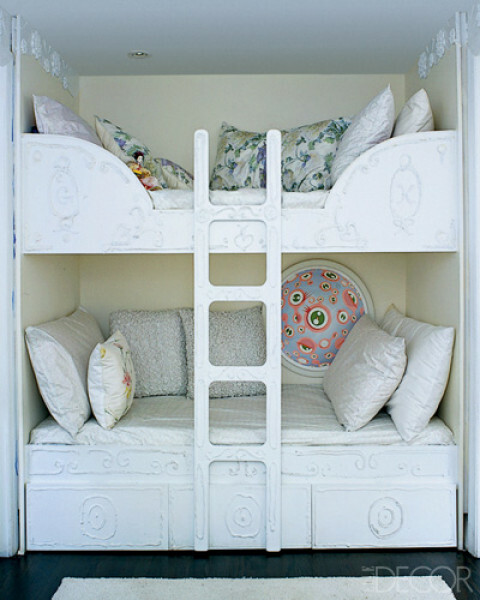 Not just bunk beds that you put in a room, but bunk beds that are built in as part of the architecture of the space. How cozy. I look at these pictures and wonder how I possibly missed out on what is a seemingly a very American experience. In one’s mind, camp looks a bit like this … but obviously in reality it did not. This is all adults creating stylized versions of summer camp inside their homes. They probably all really enjoyed designing these spaces because it allowed them to take advantage of their inner child – if only for a moment. Clearly WWB and I are going to have to give our children this all American experience. I mean, how much fun do all these rooms look? Even now, what about a weekend with your girlfriends all shacked up in bunk rooms like these? Love. Ahhh summer. Photos courtesy of Country Living, Southern Living, Elle Decor, Traditional Home and House Beautiful.